Progress seems achingly slow 'round these parts. But I did manage to piece a back for the minimalistic log cabin quilt I showed you several days ago, using the same interweave chambray in pepper that I used on the front. Instead of the cabin logs being neutrals - this time they are all bright solids, and all scraps - thus the random use of color. Linking up with Scraptastic Tuesday and W.i.P. Wednesday. I think I love the colorful scrappy back almost more than the front. It looks great to me! I love your choices of color. So GREAT! Looking forward to seeing it finished! Sometimes they don't turn out as we planned, but they always teach a lesson. I am enjoying seeing the multiple versions of this concept. Happy stitching. I really like this one! It's always a risk when doing improv, what's in our head doesn't always translate! When that happens I usually keep going...you never know and I'm excited to see this finished!! Love those colors! You've got a great feel for improv. Love this! It's really fun. 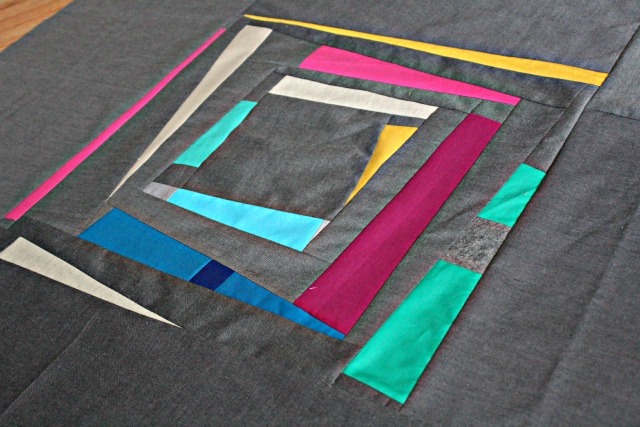 i love the way you have pieced the scraps even. the background is great too.